If Vic keeps releasing outstanding MT models every 12-15 years they will be ok in that segment I think. The Spirit ('04) and Pioneer X ('16) come to mind. We might have to wait a while for a Farmer X, or a smaller pliers based MT with a clip, but it should be worth the wait. I'm willing to attribute a portion of the "sour grapes" tone to the language barrier. Nevertheless, I can't help but note that +B's frequent complaints regarding modders cited quality issues. Now that Victorinox has altered their arrangement with +B they are having quality issues as well. Strange that the latter QC complaint is only now coming to light. Bad form, +B. In the spirit of fairness, I will say when I purchased a knife from +B--a Bushcrafter--the price I paid wasn't excessive, and the transaction was problem-free. Regarding Swissbianco, does anyone know who some Jan S. is? Lol. my thought exactly. Made my day to hear this. Global Moderator Absolute Zombie Club Posts: 20,037 I may get older but I refuse to grow up. Not one, many members over the years, and he was one of the first if not the first guy to be banned from MTO, and that while he was still a moderator here. That should probably speak for something. And the reason why the transactions with "him" aka the Canada shop are problem free is cause he's not doing them. He's a guy from Austria, also a member here, no connection with Swissbianco whatsoever. Any specific reason you're asking? PM me if it's not for the public forum. I wasn't happy about the letter he sent, but I'm going to act charitably and follow the suggestion of the earlier post that emphasizes the problems of the language barrier. It's hard to be entirely sure of his intentions and tone when he uses some very strained expressions in his English. So I will simply be charitable, and encourage the same to everyone else. I prefer to base an opinion on first hand experience. I've bought several toys from him and everything has run smoothly. I would hate to see his supply dry up. But if you guys say he was a knucklehead on MTO, I believe it. Icheatpeople also speaks of something Enki. I don't know about what, but I guess it isn't good. The only thing I've heard about recently RE:quality is problems with the Pioneer X (bent pin issue), and Delemont pliers not being shaped correctly so that they can't close all the way. I like Wenger and Delemont but I see more broken tools on them than on Vics. Not a lot, but more. I mainly like SwissB as a source for 91mm scales. I'm not a colored Alox collector, so if I can't get "late autumn harvest rust" and have to just stick to "orange" that's fine with me. I did see on the Swiss B facebook a side-by side comparison of victorinox stamped and SwissBiano CNC'ed scales showing the rough bumpy edge of the Vic and the precise edge of the SwissB...and Looking at my standard Victorinox Alox knives, I do see that rough edge, but it's not a functional issue at all. I understand being picky about fit and finish though, especially with collectors. I've purchased of few of his alox electrician runs in the earth tone colors since electrician is my favorite model, and it was kinda nice to have a couple in something besides silver or red. They were at a higher price than a one, but it was basically the only way I could get a brown electrician for instance. And now, if I'm being honest, I still carry a silver or red one most of the time anyway. Lol. But other than those couple, most my alox has been to and came back from the modders and the guys we have here do a great job. I did not notice any quality issues in the SB ones I purchased either though. Having been a member here for quite awhile, I recall Roger getting pretty worked up over modders, citing the quality control issue, costs, yadayada. To me, that was a non-issue, since a modder not doing decent work, or not running his shop properly, will soon be shut down due to poor reviews. He seemed to view knife variations other than factory offering as his private domain. That didn't work out too well for him in the long run it seems. I guess if Vic would have offered deals like this with some of our other well known modders, his exclusive deal wouldn't have been so irritating. Truthfully, what I find more irritating currently is what Vic is doing with all these slight shading alox variations, limited release colors to different parts of the world, all that stuff. All at higher prices as well. Just like Roger was doing. Aimed right at the collectors. But, as others have said, nobody is forcing you to buy them. And Vic wouldn't be cranking them out if they were not selling I would imagine. 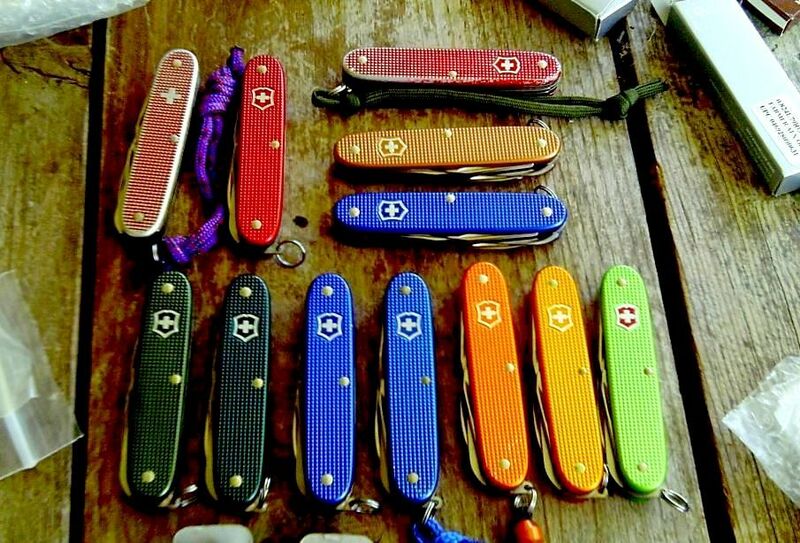 It'll be interesting to see, say in a year, if there are still these rumors concerning Victorinox floating around. I don't see them going anywhere. I may be too old to grasp it, or set in my ways to understand, but just what does this Swiss Bianco do besides sell custom color SAK's at an greatly inflated price? I've visited his web site and tried to fathom it, but I really can't. It's just like buying a new car and paying lots of money for a custom color paint job on something that is going to be used up in 10 or 15 years. Maybe I'm way too pragmatic for my own good, but I've never understood the Swiss Bianco thing. Bu then I shoot standard firearms, and the truck I bought new in 2001 still has the same wheels and paint job it came with with, and runs great. A little dinged up and 147,000 on the clock, but it's always done the job. Kind of like my Old Wenger SI in plain old silver alox. What made folks spent three and four times the money on a alox pointer or farmer just for a different color alox? Swiss Bianco seems like a version of Peter Atwood with greatly inflated prices on trendy toys for adults. I've been using SAK's since 1969, and in 47 years of use, on four different continents and one war in Vietnam, I've never had a SAK fail me. So what is this Swiss Bianco selling that makes a SAK better, or as he puts it, the perfect SAK? I'd love to be enlightened! I think right now it's mostly different colors like you said, he seems to be gearing up to release his own 95mm knife/tool, at least according to the facebook page. He's also got other things on there like whistles and fixed blade knives. But in the past I remember Yeomans with nail file on the hook, when this model was out of production from Victorinox, also his copper scales for 91mm knives are popular, I see them on here a lot on various knives. All the drama predates me joining this forum so I have no idea about any of that. I've only bought 91mm cellidor scales so I don't know how any of the Alox stuff is. Awww man...don't bring up that logical, clear thinking, common sense thing. Aside from that, there's the SAKs I leave behind....pretty colors for my Daughter/Granddaughters, cool colors for my SIL and my Grandsons, some to sell, some to keep and some to remember. And......there is the obvious psychosis that come from losing one's lifetime collection of knives, keepsakes and memories all in one terrible day. That'll leave a mark on ya. NOT SOOOOOO FAST Swiss+B ! I totally relate to colors effecting mood and gravitate towards blues. But I don't have the need to collect the same knife in every color. I prefer to collect all the different models in one color, so it's a matching set with all the variations. Just how my brain likes to organise things. But I do like to be able to choose a cool color that resonates with me. It's usually blue of some type. I'm like a bower bird with blue. Blue pioneer x posted on another thread was beckoning me earlier. Everyone has it's own way of thinking, feeling, willing. The vast majority of the world follows capitalistic rules, and in such a world supply follows demand and demand follows supply in an interdepented way. 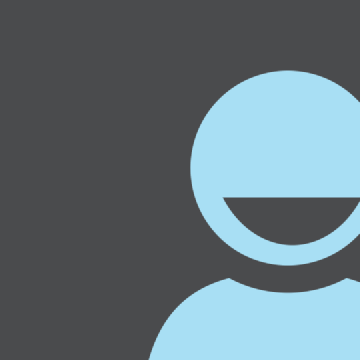 We want special forms or functions, someone will supply them for profit. They want to make a new market segment, for profit obviously, and the offer new things. If they sell, they continue, if not they try to make a new segment. People who are interested spend their money, people who don't they spend them elsewhere. That's how healthy consumerism works as we all know. So it's not bad for +B or any other factory or custom maker to offer things, either new or simple variations, because they correspond to market needs, or they construct them. Either way, nobody sells putting a pistol on our temple (although they sometimes put hoarding and greed in what's inside our skull, but you can't just blame them only, if we don't like something, we won't buy it). So, I hope +B and all others to live and more to come, in order to see more fascinating things and get more reward, either by owning something or by looking at pics and talking about, here in this forum or elsewhere. It's just, as many observed, that the market is better when it follows certain moral rules. Like "You advertise the merits of your product and you don't evince the disadvantages of your competitor products (or, worse, invent them)". "You trade with reliability and dignity". "You try to always be better" etc. I don't know Robert, I'm not interested in buying his products -although I love seeing them in the hand of others here-, I don't have a personal complaint, but I felt shame just reading his words. I don't want to , but I hope he would recall his statement. The different colored alox ones are just a personal taste preference. Same reason they offer cars in different colors and paint schemes and different interior option packages. The plain jane base model vehicle will get you where your going just the same as a model with all the bells and whistles will, but some like having the extras. But a different color of scales won't make the knife cut any better than just a plain silver one. It's just nice to have an option should you care to pay for it. No biggee. And if you have a stock of different colors, it is easier to properly accessorize when getting dressed to make sure your knife color matches your socks that day. Lol. But a different color of scales won't make the knife cut any better that just a plain silver one. It's just nice to have an option should you care to pay for it. No biggee. And if you have a stock of different colors, it is easier to properly accessorize when getting dressed to make sure your knife color matches your socks that day. Lol. This aligns with my approach, as well. Only I'm an orange guy. Furthermore, I limit myself to knives with tool combinations I find useful in my day-to-day life, which--for me--means no pruning blades or marlin spikes. Makes for a small, yet perfectly formed, collection. I'm glad I don't feel compelled to collect color variations. I'm a little bit obsessive, so that would drive me nuts. I'm glad others do, though, as I enjoy seeing pictures of such collections. 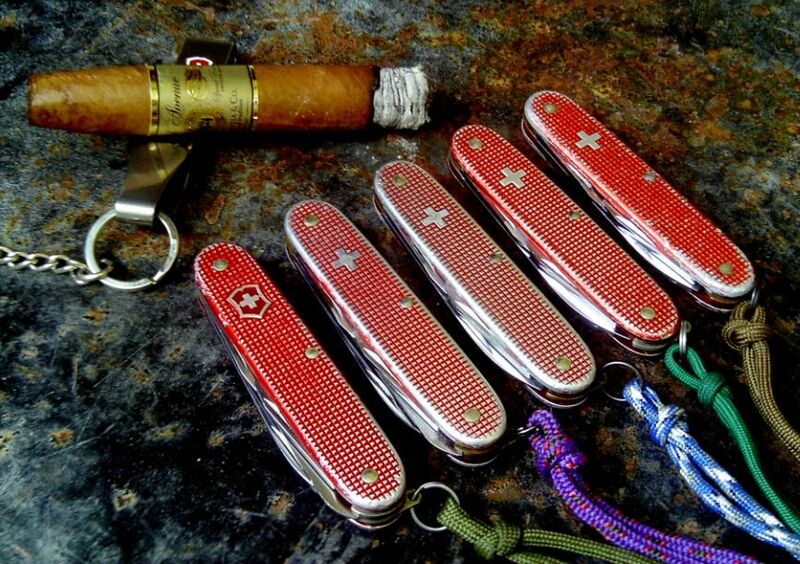 Ever since I was a kid, I have always connected swiss army knives with red scales. I do love the slimness that alox allows for, I just prefer red colored pocket knives due to my own nostalgia, and the anti-tactical vibe that they have. less red alox availability => less awesomeness in the world. As for the dramatis personae aspect I am very much a live and let live person. All I know is that I don't know anything - but I can't prove it! Reads like a passive aggressive swipe at Victorinox... and I cannot gauge whether it is bitterness, legitimate or somewhere in between. What it means? That's what I thought. They should be grateful to stand in the heavy shadow of Victorinox. Victorinox will still be here when SB will long have been gone. I don't respect whoever doesn't respect the Elsener legacy. ..,and I heard some not so flattering things about Swiss Bianco on another forum, so I'll just wish Vic good luck and stick by them.